It’s difficult to know where your seeds come from…unless you buy them from a seed company that’s devoted to organic and heirloom practices. The seed companies below offer non-GMO, heirloom, organic, and open-pollinated seeds. Click on the map below to jump to your state. 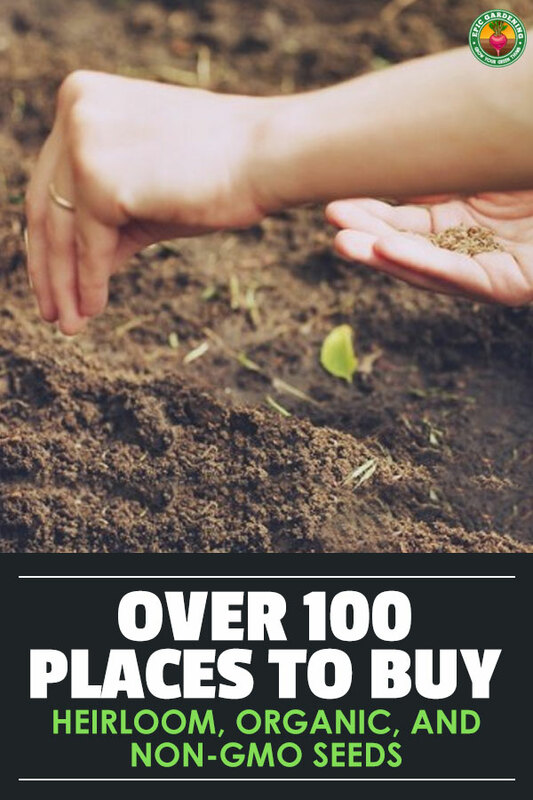 There are a few states that have no seed companies listed – I couldn’t find any companies for those states! – If you like this resource, spread the heirloom and organic love by sharing it! Diaspora Seeds California, USA. A small family-run seed business in rural Anderson Valley. Many of the seeds they offer are heirloom seeds; resilient, productive and delicious offerings from many different cultures; geographies and time. You can contact them through their online form. Tomato Fest – California, USA. Run by Gary Ibsen. He has given talks about growing tomatoes, seed saving, and organic gardening for the University of California, regional garden clubs and the Culinary Historians of Southern California and has made presentations on P. Allen Smith’s nationally syndicated television show, P. Allen Smith’s Gardens. Black Cat Seeds – Fowler, Colorado. I was a natural farmer for years but health issues forced me to sell the farm and move back into town. So I decided to bring the farm to the city and show people how they can grow their own food, raise chickens and engage in modern urban homesteading. No seed companies known for Delaware yet. Know of any? Contact me or leave a comment! Mary’s Heirloom Seeds Florida, USA. They offer all organic, open-pollinated, non-GMO and non-hybrid seeds. All the seeds that you order will be “Free shipping” and will be delivered within 24 hours with the exception of holidays. You can contact them through the online form on their website. Grower Jim’s Plants and Produce Florida, USA. They are a small sustainable farm selling fresh produce, plants and seeds. Their seeds are hand-picked, open-pollinated, non-hybrid, non-GM, and heirloom types grown chemical-free in a natural environment. Their selection includes both edible and ornamental varieties of trees, shrubs and herbaceous plants. Contact them through their website or Facebook page. Urban Farmer Indiana, USA. Huge variety of herbs, flowers, veggies, and small farm resources. Beer kits, too! Skyfire Garden Seeds Kansas, USA. They sell over 125 varieties of heirloom tomatoes; rare eggplants. heirloom peppers and more. All of these seeds are all open-pollinated, non-GMO and no-treated seeds. Order through their online form. No seed companies known for Louisiana yet. Know of any? Contact me or leave a comment! GROUNDSWELL SEED FARM Maine, USA. This is farm-based seed supplier that sells only certified organic, hand-harvested open-pollinated and heirloom seeds that are grown on their farm. No seed companies known for Maryland yet. Know of any? Contact me or leave a comment! No seed companies known for Massachusetts yet. Know of any? Contact me or leave a comment! Todd’s Seeds Michigan, USA. They are specializes in organic, heirloom, non-GMO and open pollinated vegetable, flower and sprouting seeds. Contact him through the online form on the website. Organic Heirloom Plants Michigan, USA. They raise their own organic plants and heirloom plants that are 100% free of chemical and pesticides. No seed companies known for Mississippi yet. Know of any? Contact me or leave a comment! Grannys Heirloom Seeds Missouri, USA. They offer non-hybrid heirloom seeds, heirloom herb seeds and garden tools and needs. No seed companies known for Nebraska yet. Know of any? Contact me or leave a comment! No seed companies known for Nevada yet. Know of any? Contact me or leave a comment! No seed companies known for New Hampshire yet. Know of any? Contact me or leave a comment! Fruition Seeds – Naples, New York. We spend our days growing organic, regionally adapted seed in and for the place that we call home. We cultivate over 300 varieties of certified organic vegetables, herbs and flowers. Strictly Medicinal Seeds – Williams, Oregon. They carry plants as well as seeds, culinary and medicinal, located at Williams, Oregon. Free catalog. Educational info, also. Phone: 541 846-6704. Hillside Prairie Gardens – Garlic seed in Brookings, South Dakota. No seed companies known for West Virginia yet. Know of any? Contact me or leave a comment! No seed companies known for Wisconsin yet. Know of any? Contact me or leave a comment! No seed companies known for Wyoming yet. Know of any? Contact me or leave a comment! Please look at this: I found a place on the internet listing Organic Producers and Processors. Looked up for Oklahoma,Arkansas, Missouri. But, sure there are listings for other states. SITE: ODAFF this site was dated: September 1, 2016. Names of farms, people addresses, phone numbers, and what they produce: vegetables, herbs, fruit, etc. Long Happy list of Great People Doing the Great and Right Thing for Our Country. Just remember one important point: America will never ever get healthy until it gets rid of all GMO Plants, Food. Great people with love for the earth and all life are pushing for it: 2020 or even 2021. Looking for chinese cabbage seeds in large, large bulks that will ship internationally from USA. Any places? Must be non- GMO, even F1. All organic and heirloom. Enjoyed this article, thanks! For gardeners in the Treasure Valley / Idaho area, check out Snake River Seed Cooperative based in Boise. 2015 seeds are ready! Thank you I am sure I will find somewhere to buy seeds from this directory you provided. I am wanting to start a garden in the acre plot I have behind my house. I will probably start with corn since that is the easiest crop to harvest but from there I may move to other things. Thanks for the suggestion, Janice! Added them to the list. Lookin 4 organic grass seed that tastes good to pet parrots. I have some parrots that eat all the grass seed outta their seed blends and leave the rest. I don’t know which grass seed varieties taste the best to pet parrots or birds in the wild. Can u help or refer me to someone who might know so I could purchase some? Sorry, I don’t know much about parrots – I’d ask a pet store! Sandy, did you ever find a supplier? I am looking for organic non-gmo grass seed to re-seed our chicken yard with… just outside of Pittsburgh.